by Robert K. Ressler, Thomas Schachtman | Nonfiction | This book has not been rated. "Face-to-face with some of America's most terrifying killers, FBI veteran and ex-Army CID colonel Robert Ressler learned from them how to identify the unknown monsters who walk among us - and put them behind bars. Now the man who coined the phrase 'serial killer' and advised Thomas Harris on The Silence of the Lambs shows how he is able to track down some of today's most brutal murderers. "Just as it happened in The Silence of the Lambs, Ressler uses the evidence at a crime scene to put together a psychological profile of the killers. From the victims they choose, to the way they kill, to the often grotesque souvenirs they take with them - Ressler unlocks the identities of these vicious killers for the police to capture." 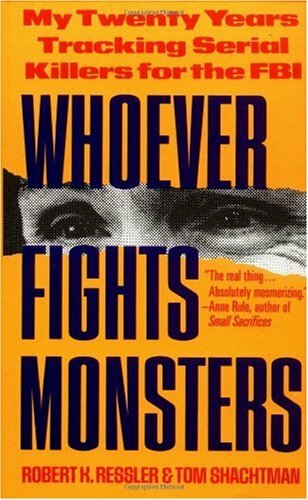 "Whoever Fights Monsters...turned out to be pretty good. The author seemed to assume a rather extensive knowledge of serial killers, and I'd probably have gotten more out of it if I'd used Google or Wiki more often. I learned quite a bit about the history of FBI profiling and tidbits about a lot of US serial killers. Probably not for my permanent collection, but I'll likely keep it around at least for a little while." Actually, though, I think I need to pass it on. So many books, so little space.